Sep 15, 2015 | By CENS | CHYN FUH ENTERPRISE CO., LTD.
Chyn Fuh Enterprise Co., established in 1993 in southern Taiwan, manufactures knock-down (K/D) office furniture and modular furniture, with a particular focus on office and computer desks. 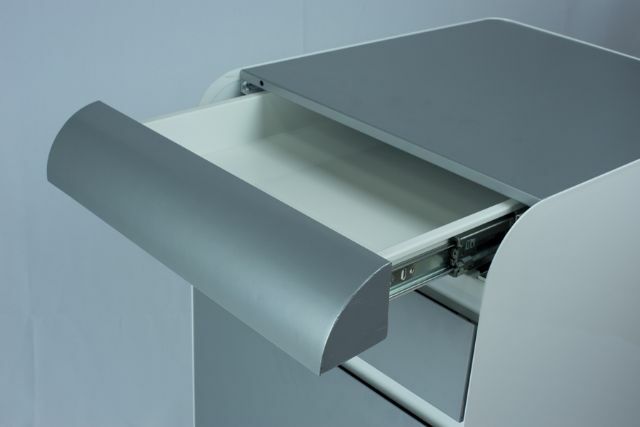 The company is promoting a beveled-edge mobile cabinet series for computer desks and office desks. The cabinets feature top drawers with beveled edge, exterior design perfectly compatible with office and household furniture and other furniture, with optional wooden or metal material for the top panel. The cabinets are sold with the company's “Rainbow” brand. Along with the company's other furniture products, the cabinets have also been shipped to more than 50 countries, including the U.S., Japan, Germany, and Italy. Chyn Fuh currently exports 70 percent of its total output. The company's domestic sales are handled mainly by Aurora Furniture, a member of the Aurora Group, on an OEM basis. The company moved rapidly to establish an integrated production facility in Taiwan in its early years, when many of its local competitors still relied on subcontractors. By doing so, the company has been able to keep costs down and fully control the quality of its products and delivery schedule. So far, the company has won at least 25 patents in Taiwan, Japan, mainland China, the U.S. and Germany, thanks to its six-person design team. In addition, it has been certified ISO-9002. The company's products are finished with static-electricity powder coating processes and go through a nine-step rust-proofing process. Also, it uses environment-friendly, fire retardant, and noise insulating materials in its products. Chyn Fuh's mobile cabinet with beveled-edge.